Vimanet has over 10 years of experience in line of business applications development. It’s the practical knowledge gained while creating a number of enterprise class products adding value to organizations all over the world. As one of the leaders in Microsoft technologies in Krakow, which is considered to be Poland’s Silicon Valley we were invited to partner with WSEI college to share our knowledge and experience with their students. 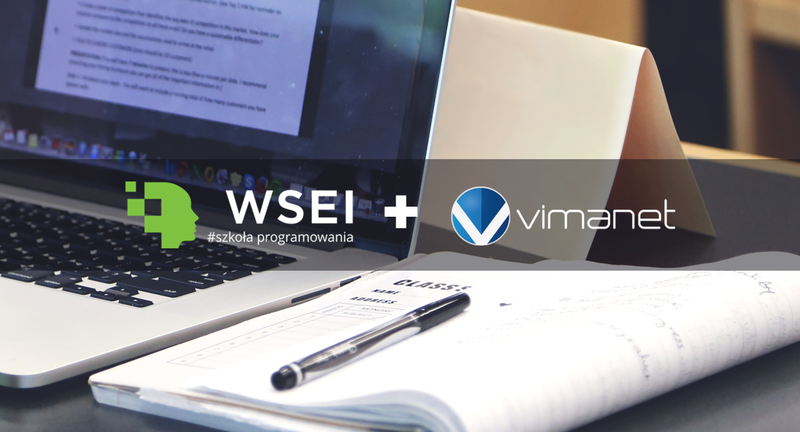 You can find us listed as a partner on the school website (http://szkolaprogramowania.wsei.edu.pl/) as well as on their Facebook profile. "At Vimanet we are very enthusiastic about Microsoft tools and technologies. Since company was founded we are also actively engaged in the partners’ network. We believe that smart people is the foundation of every company, thus learning and sharing knowledge is the core of our business. We consider partnership with WSEI college as a great opportunity to share our vast experience with young people that enter technology world. Our partnership will include trainings, mentoring, events and meetups. " Follow us on Twitter and Facebook to learn about upcoming events organized with WSEI. We look forward to new opportunities from our new partnership!